She made the sign of the cross and raised her beer. “Drink to the pole,” she said. We drank and Captain Stubby lit up what was left of his cigar. He set the rod in the corner of the porch and stood there, grinning at it. Edna came back with a bottle of blackberry brandy. Captain Stubby took a slug, and passed it my way. Edna eyed me suspiciously. She’s old, but intimidating. As a girl she worked the Ashtabula docks, hauling blue pike from the boats to the fish house for processing. Her arms are ropy, like thick mooring lines, and her neck could pass for a smokestack on a fair-sized Toledo tug. I took a shot of the pungent stuff and handed it back to her. Captain Stubby’s garden was bursting with green beans—the best crop he’d had in a decade—but Edna was keeping him too busy to harvest it. She’d earned some kind of online preaching certificate, and was blessing everything in sight. Captain Stubby became a believer after she resuscitated a rototiller that hadn’t run since 1998. Captain Stubby is my uncle, though I never call him “Uncle.” He’s always been “Captain,” and he’s always been in charge. He pronounced me a walleye angler on my first birthday, dropping a worm in my crib to seal the deal. Now, although I’m legally an adult, living in a free country, when Captain Stubby says we’re going fishing, we’re going fishing. “Shut up, before I make you a knuckle salad,” said Captain Stubby. Out on Lake Erie the wind was whipping from the southwest, kicking up a pretty good walleye chop. Captain Stubby’s boat is pink on top and white on bottom, and the previous owner—a Chautauqua water skier—named her “The Coral Mist.” Captain Stubby, with his unkempt mustache, sleeveless Budweiser shirt, and ever-present cigar stub, looks somewhat incongruous at the wheel, but the Mist’s feminine tones never embarrass him. She’s a good lake boat, and in Ashtabula, OH that’s all that matters. The wind was perfect for a bottom drift, so we tied on some bumblebee rigs. Bumblebees are night crawler harnesses with willow blades painted black and yellow, just like a bee. Captain Stubby makes them himself, and they’re his pride and joy, though sometimes the hooks are a bit rustier than they should be. Two minutes after the bumblebees went over, my rod started to bend. Without so much as a hoot, I swung a sweet little walleye up on deck. It landed on Captain Stubby’s bare feet. The next hour was action packed. Lots of silver bass, which we threw back. A couple yellow perch, which we kept. Then Captain Stubby's rod—the new one, with the fresh blessing—started doing the dance. Something sizeable was stripping line. “He’s running amok!” said the Captain, grabbing the rod. The Captain pumped and reeled. Pumped and reeled. The sun beat down on his balding head, and beads of sweat began to form on his brow. At the end of the battle a gigantic sheepshead surfaced. The Captain groaned and told me to put the net away. Captain Stubby never nets sheepsheads. To him, netting is a gesture of respect, a gesture that would be wasted on this slimy, phlegm-colored drumfish. Personally, I kind of like sheepsheads, though I‘d never admit it to Captain Stubby. They put up a great fight, and often greet you with a friendly croak. The fish was hooked deep; no way of shaking it off. "Okay," he said. "We'll break the rule this time. Just don’t tell anybody." I scooped the sheepshead up and heaved it aboard. Twelve pounds, easily. Guys from Youngstown would’ve been high-fiving each other. They come up here and keep sheepsheads all the time. But we’re Ashtabulans, and we hold out for the sweet meat. I unhooked the brute and tossed him back. “Some blessing,” said Captain Stubby. The sonar wasn’t blowing up, but there were marks, down low in the murky depths. I dropped a crappie rig over with some minnows, and the line came right back up at me, like it’d hit a trampoline down there. "Now what?" said the Captain. "Smallmouth!" I said. "Rising fast!" Captain Stubby was on the net quicker than a fly on perch guts. We don’t eat bass, but they get big out on the lake (thanks to a steady diet of invasive gobies), and it won’t be long before somebody hauls up a new state record. The smallie burst out of the water, leaped a walleye line, dove, leaped another line, and dove again, like he was negotiating a set of aquatic hurdles. This was a major snafu, but the Captain was calm. The Captain was cool. You might even say the Captain was collected. He rearranged the poles, untangled the lines, and when the smallie came up again, he tucked it into the net as neatly as a lepidopterist snaring a butterfly. “You looked just like a lepidopterist snaring a butterfly,” I said. The Captain responded to this slur by throwing my boonie hat into the bucket with the perch. I unhooked the smallmouth. He was photo-worthy, but no state record. Meanwhile, down deep, at the very bottom of our great freshwater sea, an unholy beast brooded. There was a bumblebee spinning and throbbing over his head. It annoyed him, so he gave it a thump. Then he noticed something trailing behind it. Something meaty. Something delicious. He bit it. He swallowed. The Captain said, "Hey, I think I got something here." He reeled, and the blessed rod bent double. "I didn’t get my bass picture yet." "Put him in the bucket. We’ll take it later." I dropped the smallie in with the perch and my waterlogged hat. The Captain took his time, playing the fish nice and slow. The beast was shaking his head down there, furious that his easy meal had turned into a deathtrap. When he finally surfaced, the Captain said, "Oh, sweet Edna,” and the cigar fell out of his mouth. I leaned over the transom and netted the monster before he could start wallowing. It was a walleye—the biggest we’d seen in many years, maybe ever. 34 inches long, with a gut like a Yorkshire hog. Then I remembered the smallmouth. I pulled it out of the bucket and Captain Stubby snapped a picture with still-shaking hands. We threw the smallie back and put the walleye on the stringer, with mine. "Your fish better not eat my fish," I said. When we got back to Captain Stubby’s it was nearly dark. He took the big walleye right over to Edna’s house and banged on the door. She came out with a beer in her hand and looked at the fish without an ounce of surprise. “Can you believe it?” said Captain Stubby. 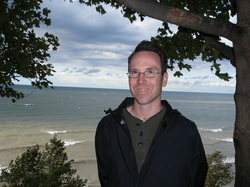 Dan Morey is a freelance journalist in Erie, PA. His creative work has appeared or is forthcoming in many publications, including Gadfly, Menacing Hedge, The Jet Fuel Review and Lantern Magazine. Find him at danmorey.weebly.com.